Nepal Investment Bank (NIBL) won the award of ‘Nepal’s Best Bank’ from Euromoney magazine’s Awards for Excellence 2018, one of the most significant accolades in financial services. 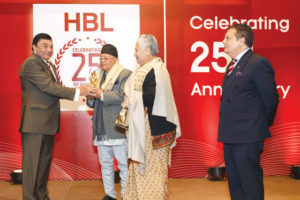 Bhuwaneshwar Prasad Shah, Director of NIBL accepted the award on behalf of NIBL, amidst a special gala dinner event at J.W Marriott, Pacific Place, Hong Kong. Among present were 500 leading banks from around Asia. “This award is a very fulfilling testimonial of NIBL’s strategic achievements”, said Shah at a press event. NIBL is the only bank in the country to have received the ‘Bank of the Year Award’ five times from Financial Times Group’s The Banker, a UK based Bank magazine and has received a credit rating [ICRANP-IR] A+ from ICRA Nepal (International Credit Rating Agency- Nepal). The bank with more than 870,000 customers has paid-up capital of Rs10.65 billion, Rs20.94 billion core capital and assets worth more than USD1.5 billion, with the acquisition of Ace Development Bank. The bank delivered a 3rd Quarter net profit of Rs2.84 billion with a deposit base of Rs130.2 billion and a lending base of Rs118.8 billion. It also has 57 branchless banking counters across remote parts of Nepal. The bank disbursed Rs3.7 billion micro credit loans to deprived sector that has helped in the sustainable development of rural communities. Euromoney, first published in 1969, is an English-language monthly magazine focused on business and finance. The flagship production of Euromoney Institutional Investor plc., awards evaluate levels of service, financial performance and other achievements across the banking industry. This year the organizers received almost 1,500 submissions from banks around the world competing for global, regional and national titles.